It came suddenly from the distant reaches of the Constellation Sagittarius, some 50,000 light years away. For a brief instant, a couple of tenths of a second, on December 27, 2004, an invisible burst of energy the equivalent of half a million years of sunlight shone on Earth. Many orbiting satellites electronics were zapped and the Earth's upper atmosphere was amazingly ionized from a massive hit of gamma ray energy. The source of the invisible attack was a rare magnetar, SGR 1806-20, on the other side of the Milky Way. These soft gamma ray repeaters, SGRs, occur when twisted magnetic fields attempt to realign themselves and crack the magetar's crust releasing the awesome burst or pulse of energy with a death-zone of a few light years. Magnetars have magnetic fields 1000 times those of ordinary pulsars -so powerful as to be lethal at a distance of 1000 kilometers. Astronomers have catalogued well over 1000 pulsars, and estimate the number of quiet neutron stars to be vastly more at some 100 million given the 10-billion-year life of the Milky Way's disk. The odds are that one is nearby, gliding sliently past Earth, of no danger. A tiny fraction of neutron stars have morphed into magnetars, believed to be the offspring of the most massive stars, hypergiants that don't have enough mass to evolve into black holes. more recently, data from satellites and observatories around the globe showed a jet from a powerful stellar explosion witnessed on March 19, 2008 that was aiming almost directly at Earth. NASA's Swift satellite detected the explosion – formally named GRB 080319B – at 2:13 a.m. EDT that morning and pinpointed its position in the constellation Bootes. 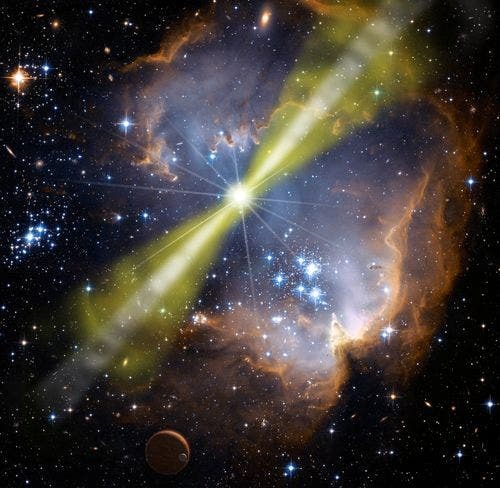 The gamma-ray burst became bright enough for human eyes to see. Observations of the event are giving astronomers the most detailed portrait of a burst ever recorded. In a paper that appeared in Nature, Judith Racusin of Penn State University and a team of 92 coauthors reported on observations across the spectrum that began 30 minutes before the explosion and followed its afterglow for months. The team concludes the bursts extraordinary brightness arose from a jet that shot material directly toward Earth at 99.99995 percent the speed of light. At the same moment Swift saw the burst, the Russian KONUS instrument on NASA's Wind satellite also sensed the gamma rays and provided a wide view of their spectral structure. A robotic wide-field optical camera called "Pi of the Sky" in Chile simultaneously captured the burst's first visible light. Such an alignment occurs by chance only about once a decade, so a GRB 080319B was a rare catch. Gamma ray bursts (GRBs) like the one detected in 2004, are most likely to originate during the formation of black holes, when intense beams of particles are shot out following the collapse of a giant star or the merger of two extremely massive stars called neutron stars. Thus GRBs begin as extreme particle accelerators. The details of what actually happens to go from highly accelerated particles to the visible GRB can be studied in detail only through computer simulations, since these extreme energies and huge sizes are beyond the reach of any laboratory experiment.